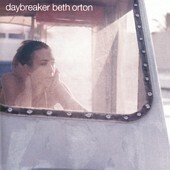 With an array of guest musicians, including Ryan Adams, Emmylou Harris, Johnny Marr, and William Orbit, there is no wonder why Beth Orton's third full-length, Daybreaker, is so strong. Orton's trademark voice is in fine form, too, breaking as she nears a note and giving the melody the bite it needs to be perfectly flawed. "Concrete Sky", with Ryan Adams on backing vocals, is the rule, not the exception, for the album. It is a heartening, mid-tempo number that seems to just chug along, laid-back and careless, sounding as if two people are just sitting with a guitar and a piano, singing what is on their mind and in their hearts, having the time of their lives. The steady percussion adds the touch to the song, the touch that pulls it all together and makes it sound more than just two people jamming, but ensures it still retains that intimacy. It is this intimacy, realized by the honesty of Orton's voice, a voice that is true to Orton's musical vision and the songs, that makes the nicely produced songs seem like they're precisely produced. They're brought to the point of commercial viability, but retain everything that each song needs to convey. The title track finds Orton staying ahead of the curve. Using the benefits of programming, along with live percussion, she pairs a few properly placed hooks, string arrangements, and a danceable beat to come up with a refreshingly creative should-be hit. The tender "God Song", Orton's gospel-influenced folk-pop, will take your breath away, its sweeping percussion and light guitar simmering in the background while Emmylou Harris and Orton trade off on the vocals, creating a rich, soul tingling sound that will make you melt. Daybreaker is one of the year's best, a fully-realized album melding folk and pop, savoring the best of each, and using Orton's voice to bring it all home. I'll give it an A.